Ok, maybe I’m stretching a bit in the title, but I just made the best burger I can ever remember having. I don’t eat a lot of hamburgers because I’m very particular about what makes an enjoyable hamburger experience and more often than not, I’m disappointed in what I get. First off, I like my burger at least pink on the inside, maybe even a bit red. So that means, I CANNOT have a burger in Canada as restaurants can’t serve them this way, (ask my father-in-law, he continues to ask at every restaurant and gets rejected every time). Next, I don’t like a messy burger. So I don’t want anything piled high with tons of toppings. I want it simple. The patty, some cheese, maybe a perfect slice of tomato, a sprinkling of raw onions and some yellow mustard. That’s it. Bacon belongs anywhere but my burger. Blue cheese is great away from my meat. Caramelized onions are a great way to combat the potential dryness of a turkey or chicken burger but no thank you on my beef burger. And please, please, please, NO ketchup. In recent memory, I’ve had some very good burgers at Shake Shack (NYC), Gott’s Burger (St Helena & SF, Ca), and of course In-N-Out burger (throughout the western states). But when I get the craving at home, I’m mostly disappointed with my burger experiences, so I thought it was time for an at-home burger challenge. I did my research and it seems like home grinding the meat was the way to go. Unfortunately, I have yet to buy the grinding attachment for my KitchenAid stand mixer. Common advice says, to ask your butcher to grind the meat for you. I haven’t met a butcher in Vancouver who will do that for you, (if you know of one let me know). So I went to the “reputable butcher” in my neighbourhood, Windsor meats and purchased a pound of their lean meat. Next up was preparation. I’ve read that over-handling the meat makes it tough, so I gently pressed the meat together to form patties. I didn’t add anything that would compromise the pure beef burger flavour I was going for, so no garlic, onions, parsley, spices or binder of any sort. I was afraid that the burger would fall apart without the binder, but I understood the technique well enough to be somewhat sure it would work. So I unwrapped the meat, divided the 1lb of meat into 3 and gently formed each into a patty. 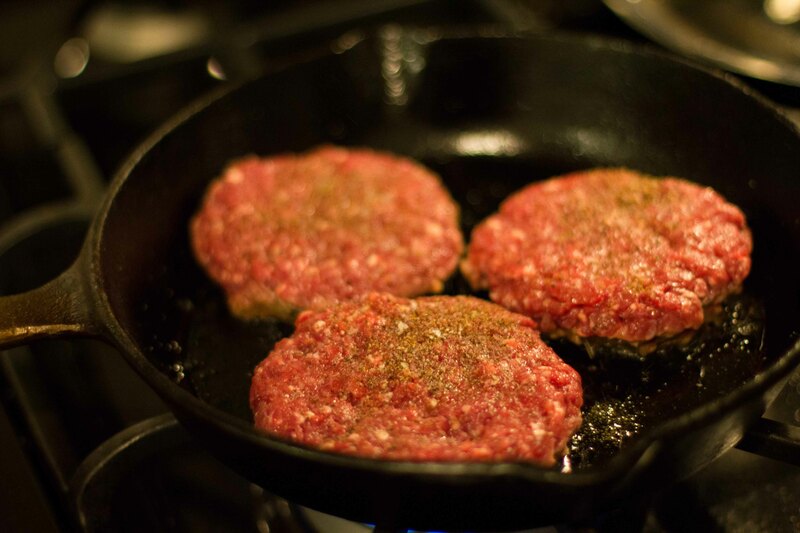 I topped each patty with salt and pepper and carefully put the patties into a hot cast iron pan. I let the patties sizzle a few minutes until they were nicely browned and having developed a crust. Then I gently inserted a large spatula under each patty to flip them. No problem with them breaking apart. After a few minutes on the second side, I placed sliced onions on the burgers and put some cheddar cheese on top to melt. After a few minutes more, I was pretty sure the burgers were done to perfect (by my standards) medium rare. I found some great looking potato buns at the supermarket that seemed like they would perfect for this simple treat. 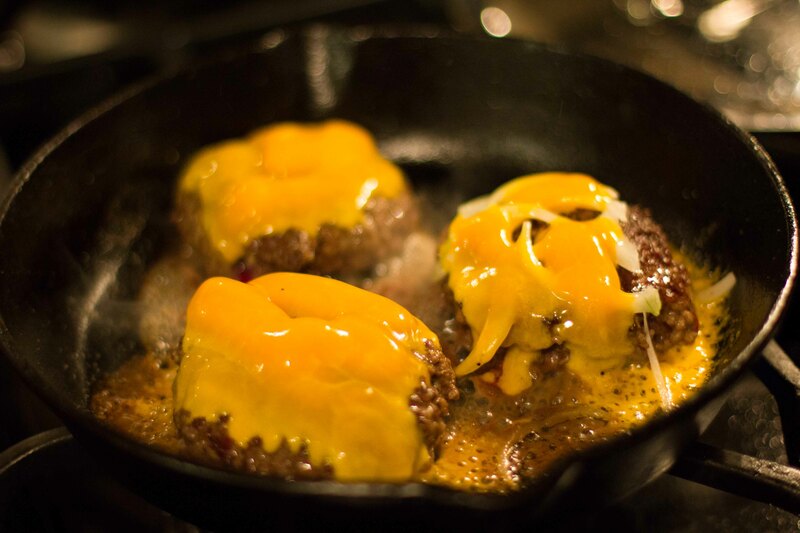 With nothing more than mustard as garnish, this is what a burger is supposed to taste like. 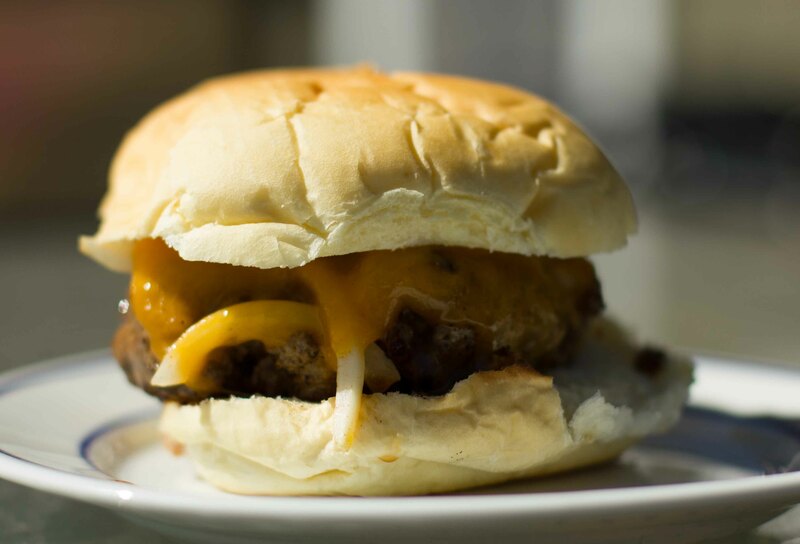 I’m happy that I’ve learned how to make “the best burger I’ve ever eaten”, because now when I crave a burger, I’ll be able to satisfy my craving without having to travel by car/plane to do so! Darn phone thwarting my typing skills! Sorry for the typos. You’ve made me sad I never tried that burger! Hi Susy; I like a burger similar to yours, not too much stuff, and taste the meat itself. I have Jamie Oliver’s recipe in which he calls for buying a pound of stewing beef and then pulsing it for about two minutes in the food processor. It works perfectly and you end up with slightly irregular freshly chopped beef. Makes a great burger. I fry my onions prior to putting them on the burger. I don’t have a food processor either 😦 Ben doesn’t like, what he calls “single purpose appliances” taking up space in the kitchen. I like raw onions, Ben likes caramelized. So we usually do a combo of both. Just tried it this way tonight, Susy, and they were very good burgers! Got the ground beef from Pete’s Meats on 12th and Arbutus. If you’re ever near Hastings and Richards, try to pick up some hamburger buns from Bon Chaz. I’m pretty sure they’re the same ones you get at Moderne Burger and they make the difference. I’m glad your burgers were good. I will definitely try out those buns. Thanks for the suggestion!